1- Put some color on that ceiling. Painting your ceiling an actual color can make the whole room much more interesting. And don’t be afraid of dark, rich color. In one living room project I worked on recently, we painted the walls a neutral taupe color, and the ceiling in a gorgeous navy blue. It turned out beautiful! 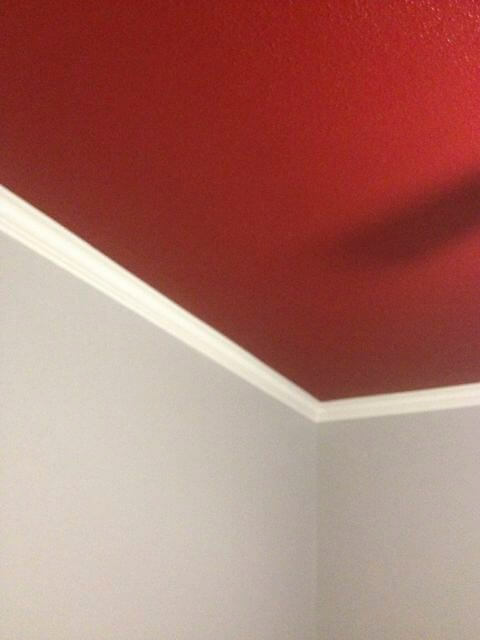 And in my son’s bedroom, we selected gray for the walls, and a deep red for the ceiling. It was Kelly Moore’s Seattle Red. We love it. 2- If high contrast colors like navy blue and red scare you, use a lighter or darker version of the wall color on the ceiling. You won’t go wrong with this strategy. 3- Wallpaper the ceiling. This looks best if you trim the edges with crown molding. You can use a tone-on-tone wallpaper to add subtle pattern and texture, or go bold with a high-contrast pattern. 4- Install trim molding on the ceiling. You can use trim molding in a variety of interesting ways. Install moldings in a grid pattern to create the effect of a coffered ceiling. Or install bead board paneling on the ceiling for a “cottage” type of look. Or, install crown molding, then install flat molding on the ceiling about 18” in from the walls; this creates an additional border on the ceiling that can be painted in a contrasting color. 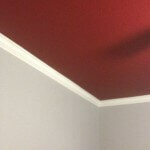 5- Paint crown molding in an accent color. Instead of painting your ceiling in a bold color, try painting the crown molding instead. I saw a photo of a living room with walls painted in a café latte color, a creamy colored ceiling, and dark chocolate brown crown molding and baseboards. It was very effective. When you have an open floor plan and you’ve painted different colors on different walls, go ahead and paint the ceiling white—it can tie all of the spaces together quite successfully. When you have white painted wainscoting on the walls. Painting the ceiling white provides continuity in the room and puts the emphasis on the wainscoting rather than the ceiling. When white is part of the overall color scheme in the room. 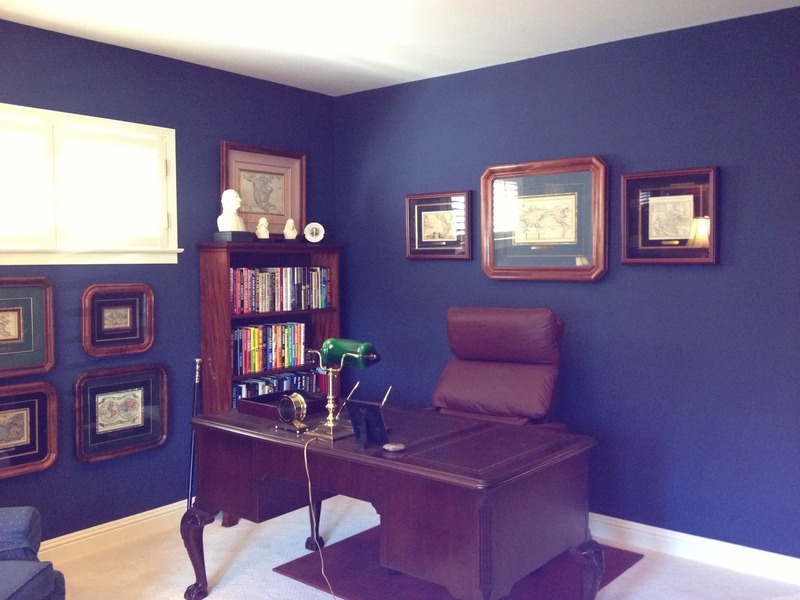 For example, in one room I designed, we used a white and blue color scheme with touches of burgundy red as accents. 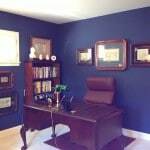 All four walls were painted a deep navy blue (Kelly Moore’s Luxe), set off with white crown molding and baseboards, white shutters on the windows, creamy white carpet and a white ceiling. The furniture was mahogany, and burgundy red appeared in throw pillows, upholstery fabric and artwork. Beautiful.